Line a jelly roll pan with foil and set a wire rack on top. Spray rack with nonstick cooking spray. Place brown sugar in a medium bowl. Separate bacon slices and add to the bowl. Stir together until the bacon is coated on both sides with brown sugar. Spread the bacon slice by slice over the wire rack and rub remaining brown sugar onto each slice. Bake until the bacon reaches desired crispness, about 20 minutes. Chop or crumble 8 slices of bacon for the muffin batter. Cut the remaining pieces crosswise into 1/4- inch strips; set aside for topping the muffins when they come out of the oven. In a large bowl, combine the flour, chopped bacon, baking powder and salt. In another bowl, whisk the egg, milk, oil and syrup until combined. Stir into dry ingredients just until moistened. Spray muffin pan with nonstick cooking spray and fill two thirds full. Bake 15 minutes or until toothpick inserted in center comes out clean. 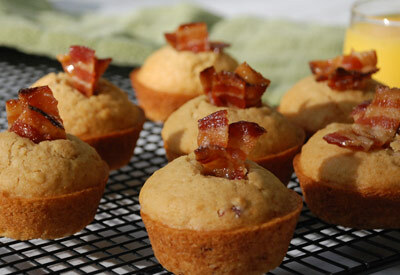 Immediately insert 3 or so bacon strips vertically into the center of each muffin so pieces are visible. Cool 5 minutes before removing from pan to a wire rack.